Being a filmmaker means you are naturally creative. But it doesn’t always mean you are great at sales. How often do you find yourself talking with a client, ready to seal the deal on a video production project, only to run into a financial roadblock? They want to know what they are actually going to get for a return on their investment in your services. AKA… How will you turn your video into a WISE investment for the client? If you struggle to put your value as a video creator into clear, direct terms, then you probably experience a lot of doubt, concern, and push back from the people you are trying to work with. At the end of the day, a business looking to invest in video wants to grow. That’s why we’ve developed the Earn the Deal sales model. 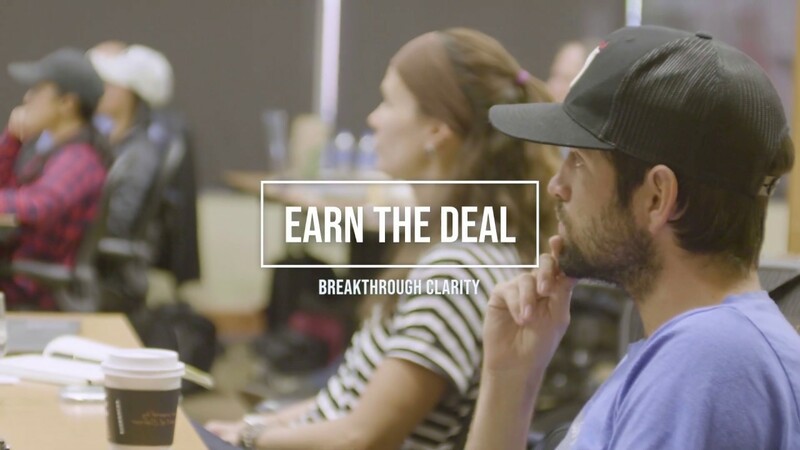 Today I want to share a free training video that gives a clear financial breakdown on how this model works so that you can approach your next client confidently. Growing your video production company is all about providing value and growth to the businesses and clients you want to work with. The best way to provide value is to have a proven system that turns your video production into a guaranteed return on investment. That is literally music to a business owner’s ears! Don’t go into the next sales meeting with only your video reel in hand, make sure you have the winning strategy they are looking for to grow their business as well. – Basically I would say, okay, so your product is worth $5,000, and your profit margin on that is 1,000, just to keep the numbers easy. Now, I asked him the question, how much are you willing to pay to get a new client? And they’ll say, well, I’d be willing to spend $500, then ask why, and then I’m gonna figure out why they came to that number and what it is. I’m gonna say, what’s your break-even point? Like, how much could we spend to get you a client where you’d be breaking even, you wouldn’t be making any money? Right? ‘Cause I wanna know that. It’s a good number to know. And then they tell me that or we’ll figure it out together. Say, alright great, so what if we had a system, and I call this a commercial campaign where basically I’m gonna create a video that is your best salesperson. If people could watch your best salesperson in action, every day, all day, online sitting there promoting and telling you the value of your product and service, and then we’re gonna drive your ideal clients who don’t know about you right now from online to this page to watch that video and then call you or fill out a form, and the way the numbers work, ’cause I’m gonna pay-per-click I’m going to pay for the people who watch the video, but then, as long as I keep those numbers underneath of $500 for each sale that you get, you know, and we’ll figure out those numbers together. Then we can acquire you, clients, rinse and repeat all day long every single week and for most people that’s enough. That’s all I have to say. Then for some people, they want to know a little bit more. They’re like, okay so, you know, tell me more about that. Then you can just walk them through it, all right. So well, if we’re spending $500 per client, you know, we’re gonna need to get how many people do you typically convert into sales after you have a meeting with them. Well, you know, I go with one in one in five, alright great, so that’s about a 20% conversion rate. So, that means we can spend roughly $100 per call. Does that make sense, how I got to that number? Everybody, good, yeah tracking! Your client needs to be tracking on this part too. So, I’m always going to be asking that. It’s like, alright, great. So, that’s how much we can spend per call. Now, if one in 10 people who see this commercial end up booking a call with you, that means I can spend $10 per person to see the commercial. Does that make sense? Great, the good news is I can get clicks on Facebook for roughly $2. So, I can get you five people, or five more people than necessary, to get you those people that commercial, and then get you phone calls, cause I know that that’s kind of the benchmark that we have there. Now the person’s starting to logically see how this system works. They’re seeing the math. They’re seeing the big picture of it, but I’m not going into how the algorithm works. I’m not going into how a campaign has three image creators with two videos, like, none of that stuff is necessary to talk about, but they can just logically see how we get to the goal. – [Audience Member] And maybe this is a question for later, but how do factor into that cost, like, your retainer fee? – So if they’re willing to spend $500 a client, and they want to get 10 clients, that’s $5,000. Right, okay. So then if that’s the case, then I’ll put, from that $5,000, I’ll take a percentage of that for management, and the rest of it goes to ad-spend. What percentage goes to management is completely up to you. In the beginning, I recommend having it being a little bit lower, right. There’s no right answer, wins, but a little bit lower’s kind of smart, and you can get it up to 50% of that is going directly into your pocket. So, if it’s $5000, you’re making $2500, you’re spending $2500. Make sense? – [Audience Member] Like, the add-spend element in the sales meeting? – I do, but not until the end of the meeting. This part is kind of happening right in the desired, well, current situation, desired situation, and then we sort of talk about, alright, well in order to get to that desired situation, here’s what that would, you know, I imagine you’re wondering what that would look like, right. – I use that a lot. I say, well I imagine you’re wondering what this would look like. And that is like, well yeah, I am. – Then we just go through that kind of conversation right there, break it down on a simple level. – [Audience Member] You just got to the point of saying you want 10 clients $500 a client, $5000, right, and then you went to the next step, what’s your fee gonna be out of that, say it’s 50%, now you just took that in half to $2500, so now they’re only gonna get five clients. – No, you’re just gonna spend $250 per client, all from an ad-spend perspective, 500 in total for them, right, ’cause they’re still spending $5000 going to you, right. $2500’s going to ad-spend, $2500’s going to you. So, you’re still spending $500 per client in terms of cost per acquisition. Does that make sense? – [Audience Member] So, that would depend on your abilities to get new clients? – That would depend on your ability to get new clients, correct, yeah, but that’s the reason that we have the ad-spend be a little bit higher in the beginning until you start to get this proof of concept. – [Audience Member] You break it down into percentage usually, or like a typical, like, just a set fee per month? – In the beginning, I would kind of know the number that I would be willing to do it for. So if I want $1000 in management fee, or I want $2500 in management fee, I have to know kind of an idea of well what is it that this person wants to make, and that number needs to be big enough to where I have that value in it for me, right. So, the person’s thinking small in terms of their desired result, I’m gonna tell them to think bigger. I’m gonna tell them to start thinking about instead of going from $10000 to $20000, let’s go from $10000 to $50000. – [Audience Member] Yeah, and you’ll do this math on the fly on the call ’cause you don’t know it before you go into the call, yeah. – [Audience Member] But then they also have to have, like, a minimal profit margin, so that it makes sense for them too. – But that’s in the cost per acquisition. That’s why we’re asking how much are you willing to spend to get a client. – [Audience Member] Right, but you might come across someone who, like, has a very small margin or something, and then you go well it’s not gonna work because your margin is not big enough for this to work. – [Audience Member] Online, was that online? – Online through e-commerce, and that’s the only real way to get those smaller dollar products to work. He said alright, well, what’s the highest value thing that you sell, like, it’s this bundle of skin products, and we have like $360. So, he started selling that. – [Audience Member] Bundling them? – Mmm-hmm, you can bundle things together. – [Audience Member] Like, when you helped Miranda with the massage, would you bundle, like, get a package of 10 massages, something like that? – Yep, that’s exactly what we bundled, roughly 10 together, so that was about $800, and we drove traffic to that, and we also knew, like, I knew that almost all of her clients are repeat clients. Her lifetime value is in the thousands per client, actually. So, ’cause our ad-spend was really low on that campaign to fill her week, it was really simple. We knew we didn’t have to spend that much to max her out ’cause of the repeat client aspect of it. So, even if they didn’t buy a bundle, which a lot of people did ’cause it was cheaper by a little tiny bit, we were able to max her out simply by just getting the repeat client aspect even if we were buying one pack one time. – [Audience Member] So, you did sell the individuals too? – [Audience Member] What was the sales final? It’s just like a call-back? – It was a lead-generation sales final, yeah. I had one landing page, and ads going to it from Google, and we had a little really simple commercial. Some of you may have seen it. I mean, it was literally just a walkthrough of the massage space, and we’re right there. – [Audience Member] So, the sale of the, whether it was one or a whole package, was on the phone? – Yeah, it was one the phone. So, she would get phone calls or form submissions, and the phone calls when they came through, she would have then book right then. So, alright, here’s your appointment. It’s going to be this much for the first one, and if you get a package, it’ll be cheaper. We’ll talk about that once you get in here, but they already knew they were gonna pay ’cause they were getting a massage right then and there. – Not long. Not very long, yeah, and that was one of the reasons, like, that campaign was so simple was because, like, I could easily max out, like, any massage business here with like 10 people at it, just in a couple weeks probably, a couple months, and then the issue is, ’cause you can iterate the creative to make it so much stronger than what I did. I could’ve made the creative way stronger to where it was a demonstration commercial of her actually giving a massage, and who’s not gonna go get a massage after watching one of those, right. So, I could have done a lot of things to make that campaign way stronger, but I didn’t need to ’cause I was getting the result we wanted.